We spent over 20 hours researching and testing 20 different types of bike pumps and found that durability, pumping capacity, and ease of use were most important. The Lezyne Floor bike pump scored high marks in all categories and is our top pick. The construction includes a steel barrel and piston that are durable, an aluminum base and comfortable wood handle that is easy to use and hold onto while pumping. The pressure gauge is 2 ½” in diameter and easy to read. This pump offers 160 PSI 11 bar of pressure that is perfect for inflatables, bike tires and more. When you regularly ride a bicycle, whether for pleasure, transportation or exercise, the last thing you want to deal with is a flat tire. Bike pumps are used to inflate the tires on a bicycle quickly and easily. With so many different choices being available, trying to decide which one will work the best for you can be a little daunting. Bike pumps come in all shapes and sizes so there is literally a bike pump available for every circumstance, whether it’s to find something small enough to carry in a back pack, to having something a little larger that has additional valves to inflate other items like basketballs, footballs and water floats. These three top rated bike pumps are excellent for many reasons that we will share with you so you can see if any one of them fit what you are looking for. With the right information, you can make the choice that will work the best for you. Lezyne adds durability to function with this well made, strong high pressure floor pump that is made with a strong steel barrel and piston. The aluminum base, wood handle and composite Matrix connectors finish off the well-built construction. There is a speed chuck included that makes the pump compatible with disk wheels. Easily see the pressure gauge thanks to its over-sized 2.5” in diameter size. This Lezyne pump has an ABS flip-thread chuck and 43” rubber hose that works for both Presta and Schrader valves. Maximum pressure capability with this bike pump is 160 PSI 11 bar. The painted barrel looks great and gives it a stylish look as well. Measures of this bike pump are 7.5” x 2.4” x 20” making it a bit too tall to carry comfortably in a back pack, but you can carry it in the trunk of your car if you travel to your biking destinations. Cyclists will appreciate the construction, functionality and reliability of the Lezyne Bike Pump. If you ride your bike frequently, this is a great pump to have on hand for low tires and flats. You’ll be back on the road in no time. The Topeak bike pump is not just for amateurs, professional cyclists use it too. The construction of this popular bike pump is comprised of high quality materials and components that will stand up to moderate use. It has been tested for both quality and durability. It has 160 PSI 11 bar capability and works on Schraeder and Presta valves. The look of this pump is more industrial and is sturdy and easy to use with a large, easy to read dial to see what the tire pressure is. The polished aluminum base is attractive and easy to clean. If you use your bike on a regular basis, you will love the performance of the Topeak JoeBlow Pro Floor Bike Pump. Users will find that it pumps tires up effortlessly with only a handful of pumps necessary to achieve the proper tire pressure. While the pump is a bit bulky to carry around, if you drive to your biking destinations, this pump will most definitely fit in the trunk easily. The bike pump measures 6 x 12 x 29 inches which makes it too long to carry in your backpack but for those who aren’t looking for a pump that they can carry on their bikes rides, this one fits the bill. The Serfas FMP-500 floor pump is bright orange and ready to take care of all your bike tire inflating needs. The integrated air release valve is on the pump head. The valve fits both the Presta and the Schrader valves. It is constructed with a metal barrel and stainless steel braided hose is strong and handles moderate to heavy use easily. The PSI on this bike pump is 260 making it capable of a bit more heavy duty than other bike pumps. Read the tire pressure easily with the oversized gauge. It is equipped with a ball and carious accessory attachments. The pump measures 6 x 11 x 27 inches and is perfect for taking with you on trips where you will be riding your bike. This pump isn’t made to carry in a backpack but at 27 inches, it can fit if need be. For those who do a lot of bike riding and who need to keep their tire pressure consistent and where it needs to be, having this pump prevents frequent trips to the gas station where you have to pay for air. The bright orange color makes it flashy and stylish in addition to being functional. The orange legs are just the right size to stand on while you are pumping up your tires effortlessly. It may not be as fast or easy as the large air pumps or compressors, but for a manual option that is easy to travel with, the Serfas is perfect. Any one of these top rated bike pumps are the perfect choice for all of your bicycle tire inflation needs. Each of them is strong, durable and long lasting and offers the PSI that you need. They are also capable of being used of Presta and Schraeder values and will work on almost every bike. They can even be used to inflate other items too such as volleyballs, soccer balls, footballs, pool inflatables and exercise balls. Continue reading below to learn even more about bike pumps, how they work and what features make one better than another. With this knowledge, you will be able to sort through the many models there are on the market and come up with an excellent choice that will work for your specific needs. Our buyer’s guide has been written with the goal of providing you with all the information you will need about buying the best bike pump for your lifestyle and bicycle activity level. There is a lot of information to be learned about bike pumps. This information will help you make informed decisions when it comes to the models you consider for purchase. You still may end up with more than one model that you like, but after reading this, you will know what features to look for and compare and you will also know what your own personal requirements and lifestyle needs. If you ride your bike very infrequently you will not need as heavy duty of a bike pump as you will if you are on your bike every single day. Having the capability to take care of your bikes’ tires and ensure that they are always containing the recommended PSI. The bike pumps reviewed here are also known as floor pumps. They are designed to inflate bicycle tires as well as a myriad of other toys. There is a gauge that is fitted to most bike pumps so you can see how much air pressure the tire has as you fill it up. Listed below are the different types of bike pumps with a bit about each one. Stand pumps – A stand pump and a floor pump are the same thing. They are a very common type of pump that is used to fill up bicycle tires. They are easy to use and even kids can use them. Just stand on the foot pedals and push down on the handle to fill your tires. Hand Pumps – Hand pumps are significantly smaller than stand pumps and can be attached to the bike and carried along with you on your rides. A lot of people have a harder time using hand pumps and find that they are not as fast or efficient as the stand pumps. There is a separate tube tht hand pump come with that will connect the pump to the tire. Foot Pumps – It may sound far-fetched but foot pumps were originally designed to be used on vehicles and not bicycles. If you get an older model foot pump you will need to purchase an adapter for the valve that will allow it to be used on the bicycle. Since they weren’t designed for bicycles originally, you may find that they don’t fit the standard Presta and Schraeder valves. Foot pumps generate a low amount of pressure so you will find the best results when using them on low pressure tires like mountain bike tires. CO2 Inflators – while the efficiency and speed in which these pumps work, you will find that the CO2 leaks out through the inner tube very quickly. For this reason, you may not find the use of CO2 inflators, anything more than an emergency measure or method that will get you home in the event of an emergency flat. Electric Pumps – Electric pumps are used to inflate motorcycle, vehicle and other motored vehicles. Electric pumps are typically very heavy and need electricity of some kind to run. A popular feature of electric pumps that consumers like is that the desired PSI can be pre-set and the pump will inflate the tire until the desired tire pressure is reached. Be sure if you are ever using an electric bike pump that you set the correct pressure so the tire does not over inflate and burst. Each type of bike pump has uses that they are better suited for than the others. We’ve outlined the, for you below. Stand pump – Stand pumps are good for amateur cyclists, those that are not able to use their upper bodies to depress the handler and inflate the tires. They are also used by recreation al cyclists who may just ride on the occasional weekend. They are simple for the user to operate and you don’t need any electrical source to use them. They almost always have a universal adapter that makes them able to be used on any bike. Hand Pump – Hand pumps are used in many different ways. They are recommended for semi-professional cyclists as well as amateur cyclists, and any user who regularly uses a bike. Hand pumps are lightweight and very portable and are also the least expensive of the pumps. They also do not require any additional power source other than the user using an upper body pumping action. 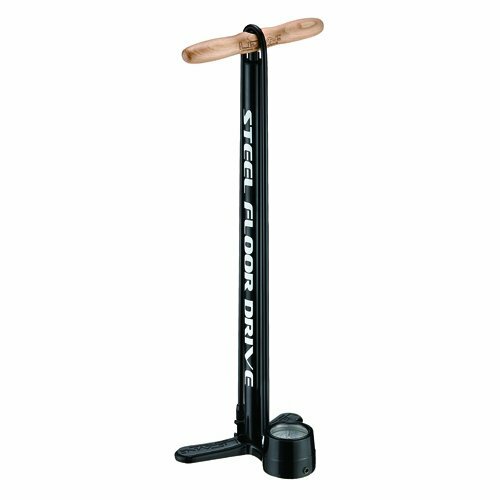 Foot Pump – Foot pumps are perfect for low pressure tires including mountain bikes and other low pressure tires. It is also good for amateur cyclists and users that are capable of using the lower body for the pumping action the foot pumps require. Foot pumps are very efficient and accurate and simple to use as well. Electric Pumps – Electric pumps are heavier and less portable than other types of pumps. They are recommended for users that do not have the physical ability to use a pumping action with either upper or lower body. They typically have a pressure gauge and are accurate as well. CO2 Inflators – CO2 Inflators are accurate and compact. One of the pluses that they have is their ability to work very fast and they do not require physical action on the part of the user. They are most often recommended to be used by semi-professional and professional cyclists and users who need their tires inflated quickly such as those in a race or marathon of some kind. There are many different considerations to look at when shopping around for a bike pump. The things we’ve listed below are the most important to look at. Metal alloy construction with replaceable parts – There are some bike pumps that have all plastic parts. They are definitely less expensive than the metal alloy models but they don’t last anywhere near as long and can actually break quickly. Look for bike pumps that are constructed from metal alloy and steel parts and you will find that they last much longer. Taller is better – Tall pumps deliver more air to the tire for each stroke of the handle. This means you will have to work a lot less to achieve the same results. Look for a good gauge – A reliable gauge is important because you will be able to ensure that you are inflating the tires to the recommended pressure. Gauges are either at the top of the bike pump or at the base. Higher mounted gauges are much easier to read simply because they are closer to your eyes when you are using them. A good, sturdy base – When you are using a standard bike pump, you will place your feet on the base to hold it steady while you are pumping up the tires. Those bases cab either be fixed position bases or fold up. Fixed position bases are sturdier to use and offer better support to the user. Connectors – Make sure that the connectors fit standard bike valves. The two types of valves are Presta and Schraeder. Your safest bet is to buy a bike pump that fits both types of valves since bikes will have either one or the other. The most common type of bike pump is the standard bike pump. There are many different things about it that make it a preferred piece of equipment to own if you have bicycles, whether you use those bikes for pleasure, for the kids, for exercise or if you are a serious cyclist that enters races and competitions. They are not very expensive, and if you invest in a good quality model with metal alloy and steel parts, you can expect to have it around for a long time to come. If you opt for the higher quality models, they are also usually capable of having replacement parts available as well. If you have one or several bikes in your home, having a bike pump on hand will be a good investment for you to make. It’s great for taking on trips and some of the standard bike pumps are small enough to fit inside a larger backpack if needed. The information in this guide will help you determine which bike pump is the right choice for you and will be determined also by what you do with your bike. A professional or semi professional cyclist will require higher quality than a pleasure rider but regardless of which you are the one thing that remains consistent is that if you have a bike pump on hand, you will never be caught stuck with a flat tire.